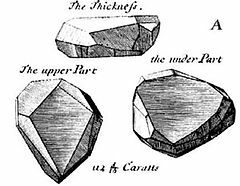 History can't quite tell us when the rough diamond made its way to King Louis XIV, however, upon receiving it, he had the stone recut into what he would call the Blue Diamond of the Crown of France, a brilliant stone of more than 60 carats. After the king’s death in 1715, the stone was passed to his son, King Louis XVI, whose wife was Marie Antoinette. The stone disappeared from history in the 1790s when it was stolen. 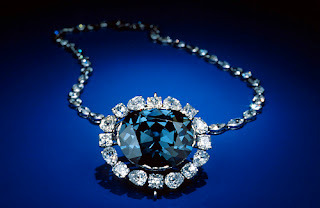 It was never seen again in its original cut state, but reemerged again in London as the Hope Diamond, now a much smaller version of its original. Weighing just over 45 carats, the Hope Diamond has been displayed in Washington’s National Museum of Natural History since 1958. Its brilliant blue, which is likely caused by the presence of boron in its chemical makeup, captivates visitors near and far. In the 1990's, the Gemological Institute of America graded the diamond's color and officially named it a "fancy deep grayish blue." We couldn't have said it better ourselves. the historic relationship royals have always had with jewels. The crown was created in 1937 by the official Crown Jewellers, a position held by Garrard & Co. since they had been appointed to it by Queen Victoria in 1843. Garrard & Co. already had quite a reputation before this, having had supplied aristocrats and royals with jewelry and other fine gold and silver items since 1722. In addition to the crown, Garrard & Co. have created a variety of well-known items including the famous sapphire engagement ring given to Princess Diana by Charles, now worn by Kate Middleton, and the real Heart of the Ocean inspired by the film Titanic. 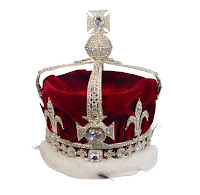 While equally, if not more famous than the Queen’s Crown, neither piece is superior from a gemstone perspective. 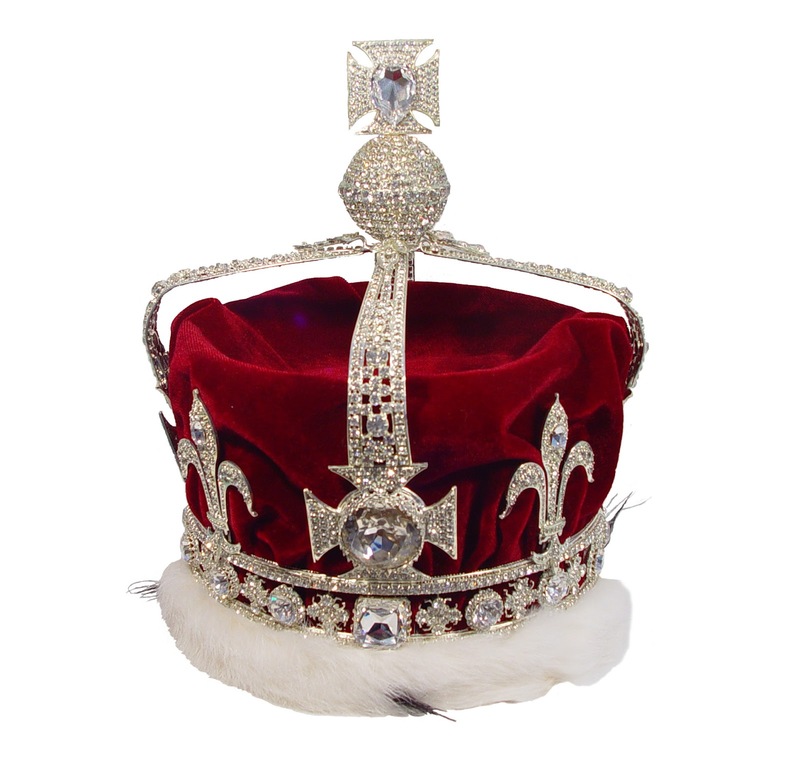 Adorned with 2,800 diamonds, including one massive 105-carat center stone, the crown is without a doubt one of the most spectacular pieces of jewelry created in the 20th century. While its history is entirely fictional - loosely borrowed from that of the Hope Diamond - at least one of the existing Heart of the Ocean necklaces is 100 percent real. Based on its description by director James Cameron, two replicas were originally manufactured to be used in the movie. These replicas are both very similar in nature, with a large blue center stone surrounded by clear stones, hung from an 18-inch chain. Both looked stunning but were nothing more than costume pieces. However, shortly after the movie was completed, the British Royal Jeweller Garrard & Co. created a real version of the beautiful movie prop by surrounding a magnificent 170-carat sapphire with 102 stunning white diamonds. In total, the necklace boasts 200 carats of gemstones, for which it fetched a price of $1.4 M at auction. 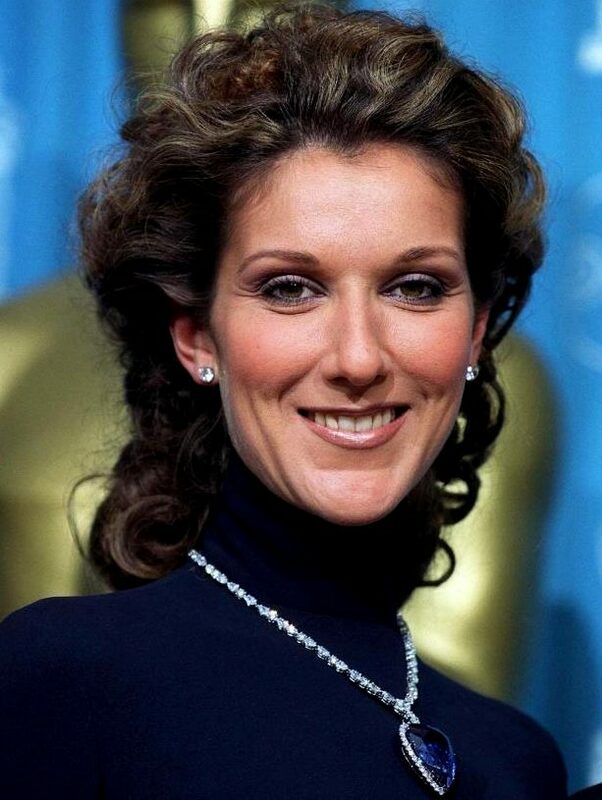 The necklace has only been worn publically by Celine Dion at the 1998 Academy Awards. No one knows why she wore a turtleneck. at the height of motion picture popularity, and her success continued well into adulthood, growing impressively as production studios began to place more emphasis on the quality the films they were making. Miss Taylor became one of the most critically acclaimed actresses of her time, so valuable in fact, that she became the first actress in history to be paid $1M for a movie role. 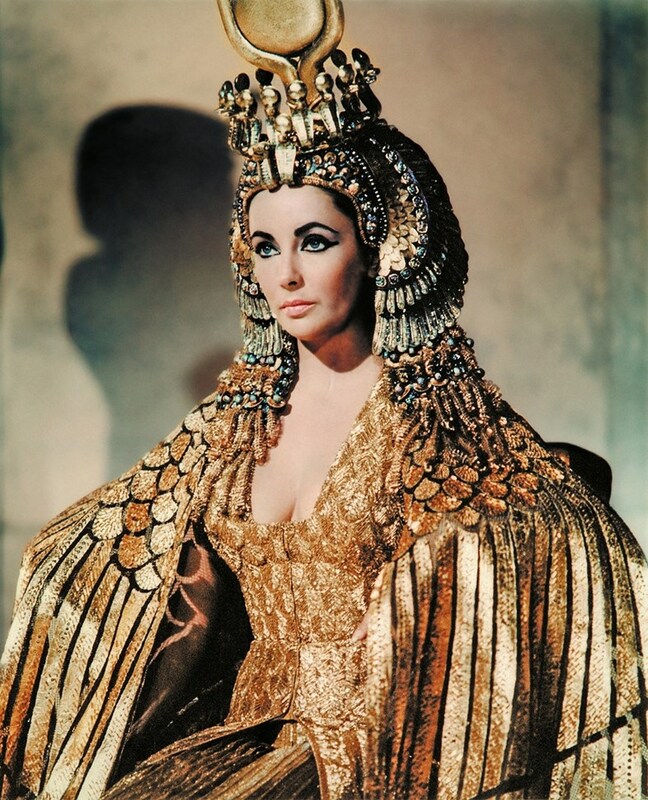 The role was Cleopatra in the 1963 film Cleopatra, on the set of which she met her fifth husband, Richard Burton. 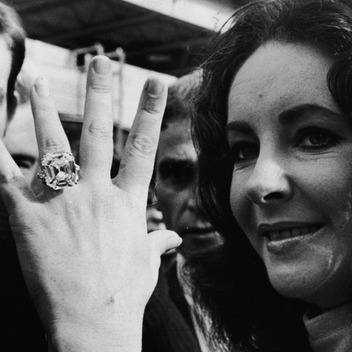 Elizabeth Taylor's famous engagement ring was just one of several impressive pieces Richard Burton lavished upon her during their often-scandalous decade long relationship, resulting in a jewelry collection that ultimately garnered more than $150M at auction after her death, the benefits of which were donated to ETAF - the Elizabeth Taylor AIDS Foundation. Cleopatra's jewels were largely thought lost until about 2,000 years after her death, when a sizable collection of artifacts began to be uncovered. Much like her portraits depicted, her jewelry pieces were elaborate, beautiful and ornate. 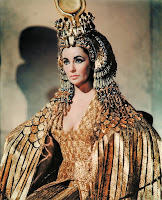 When Cleopatra inspired Hollywood director Joseph L. Mankiewicz to create the 1963 film Cleopatra, Elizabeth Taylor was a natural choice for the part. Both women were adored, powerful and had expensive taste. bankrupted 20th Century Fox. Costume designer Renie Conley spared no expense, spending nearly $200,000 on gold capes, ornate headdresses and fine, realistic jewelry. The Queen of the Nile would have been proud. The self-proclaimed goddess was known to wear jewelry even while bathing, although this likely stems from the belief that certain gems possessed magical powers that could protect a person from evil spirits. Cleopatra is thought to have worn an amethyst ring to ward off inebriation, which probably came in handy since she engaged in nightly wine drinking binges with her drinking club, the Inimitable Livers.